I live in the South and am not ashamed of that whatsoever. Tonight's dish comes straight out of the South, because what's more Southern than a chicken casserole out of a Baptist Church cookbook? In 2008, the church I attend (Buffalo Ridge Baptist Church) presented its members with a cookbook to celebrate our then pastor's 45 years of serving in the church. There are 202 pages of wonderful looking recipes but the one that stuck out to me the most was the "Chicken Noodle Casserole" by Trina Foster. For some reason it just jumped out of the page at me and I've been making it for a couple years now. 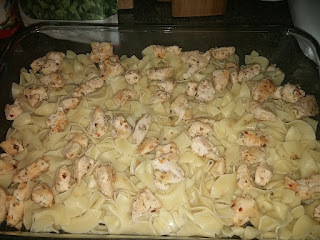 I even have friends request I make this dish when they come over for dinner because it's that good! So, of course I can't keep this beloved dish a secret! If Trina or her husband Scott are reading this, I have made some very slight changes to what was printed in the book just so you are aware. 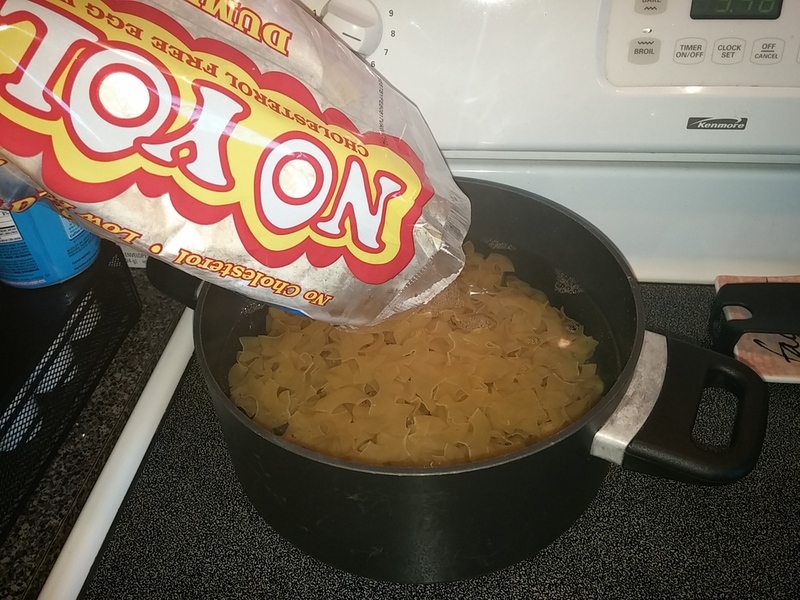 Pour the entire contents of your 12-ounce egg noddles into the pot and leave them at a gentle boil. Cook until noodles move easily and are fairly springy. If you need to, pull one noodle out and test it. 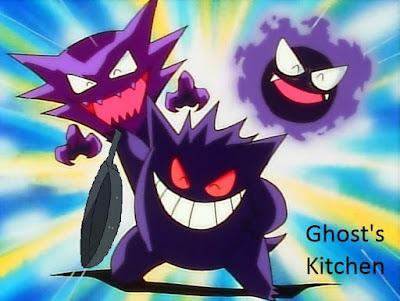 If chewy continue to boil for a couple more minutes. 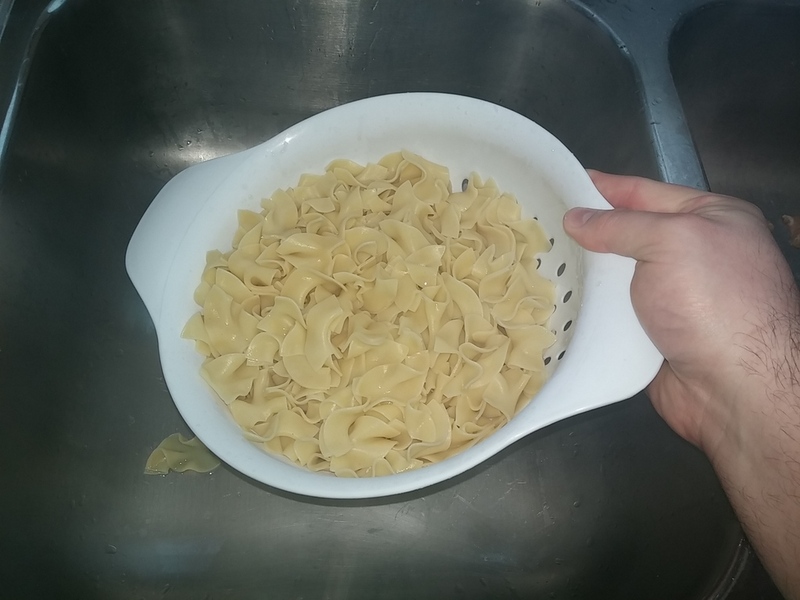 Once fully cooked, pour noodles and water into strainer in sink. Shake strainer to get as much excess water out as humanly possible. 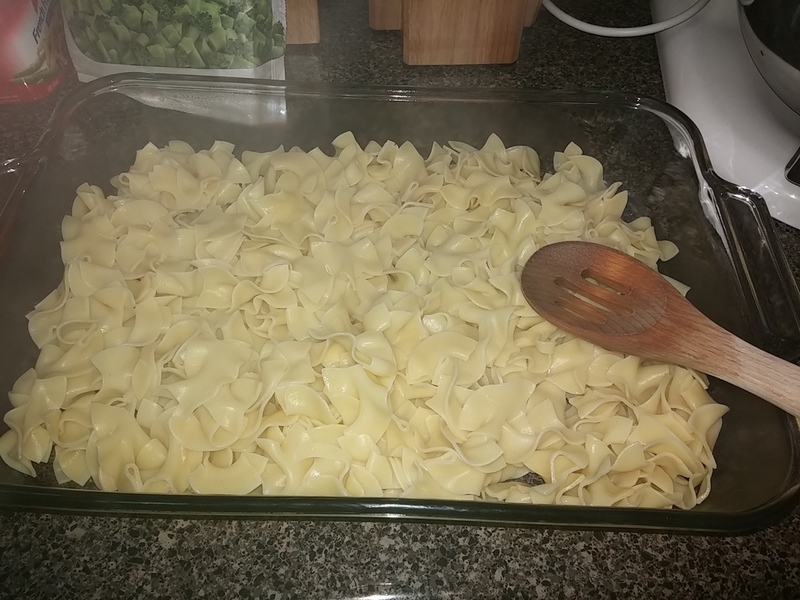 Pour your noodles into the glass casserole dish and spread them out evenly along the bottom of the dish. You can use your hands or a spoon depending on your tolerance for heat. Set the casserole dish aside for now so that we can focus on the chicken. Get your chicken breasts and ensure anything undesirable is removed from the breasts. 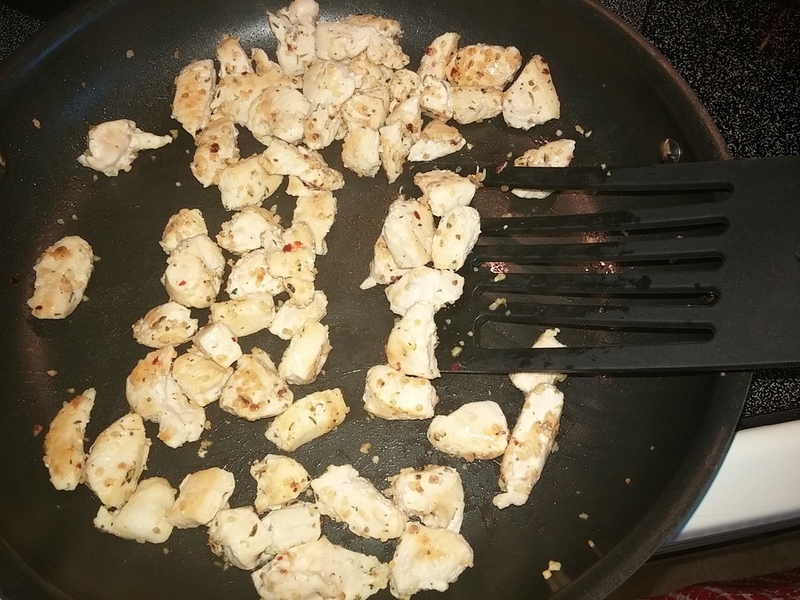 Once that is complete, place your chicken breasts on the cutting board and cut them into 1-2 inch pieces as in the picture above. Think of what a child's bite sized piece would be, not your man-sized chomper! 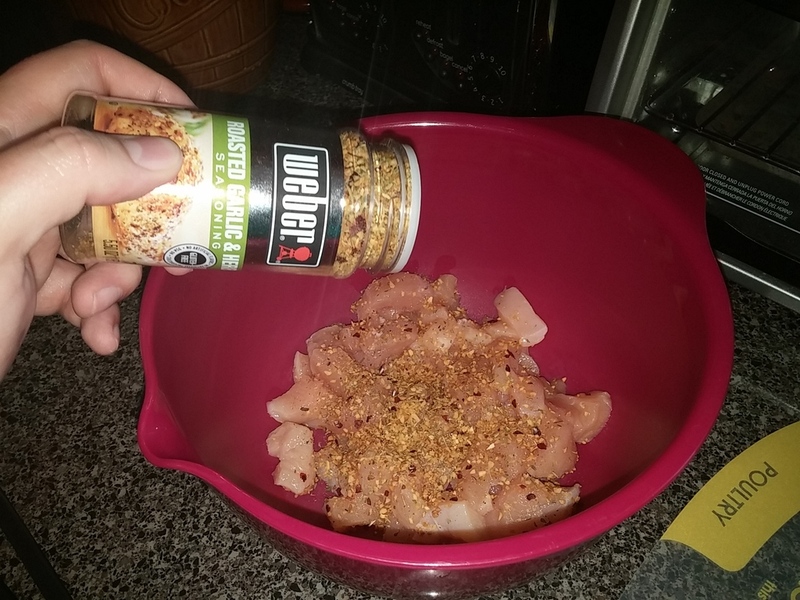 Use your favorite chicken seasoning and coat the chicken pieces. You can simply do this on the cutting board then turn the pieces over to coat the other side, but I prefer using a small mixing bowl to dump the seasoning on top and mix it by hand. 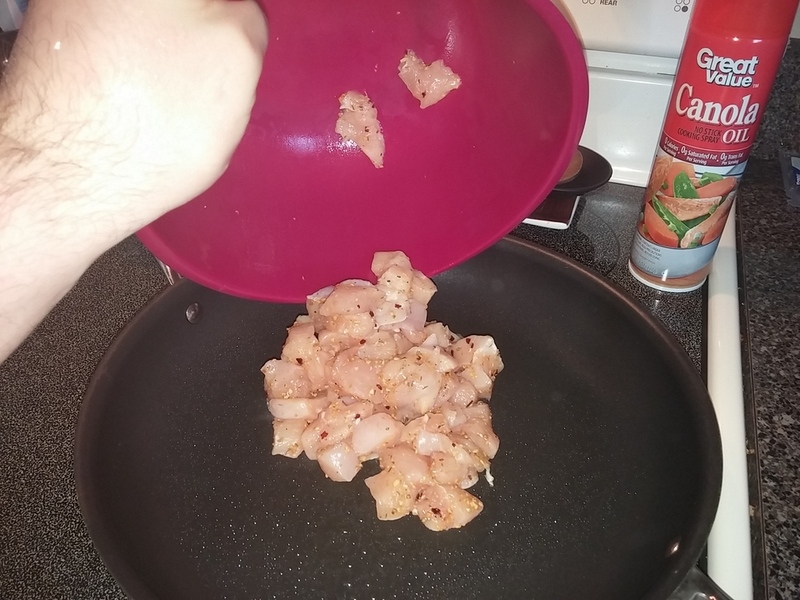 With Skillet on medium-high heat, spray the skillet with cooking spray and place the chicken pieces in the skillet. Use your turner to spread them out evenly along the skillet turning when necessary until they are completely cooked. 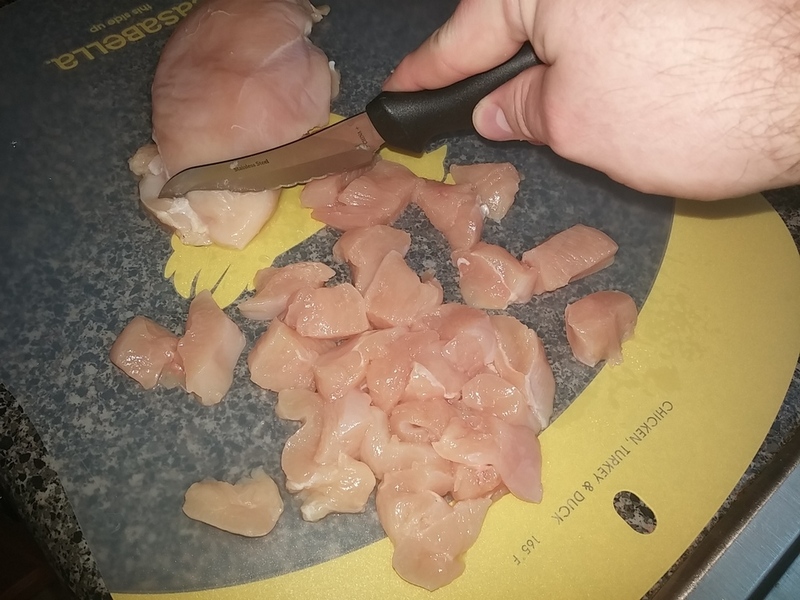 You can easily check if they are completely cooked by using your turner to cut a larger piece in half and inspecting what was inside. It should look something similar to the picture below. At this point you'll want to preheat your oven to 350°F. It should be ready to go by the time you finish the other parts. 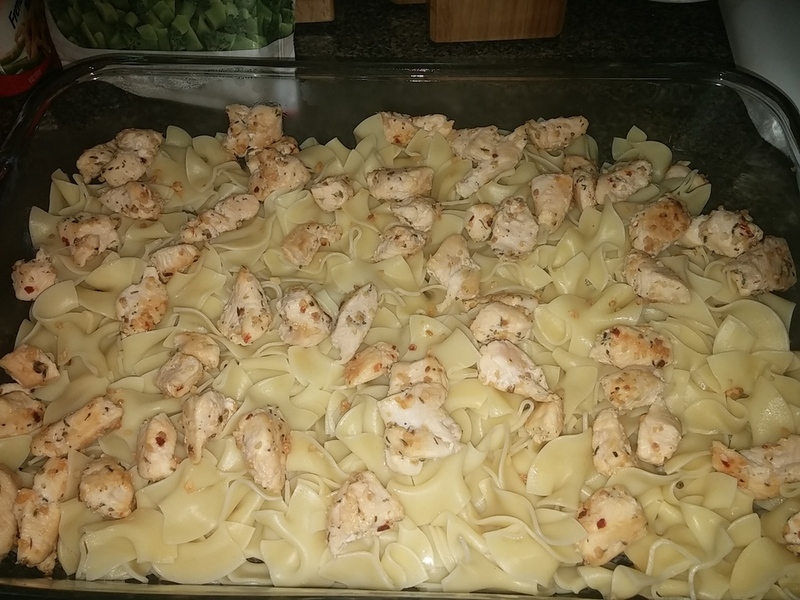 Bring your casserole dish back over and with your turner, get the chicken pieces from the skillet and spread it out fairly evenly over top of the egg noodles. Don't be afraid to use your hands. At this point you should add your broccoli to the mixture. 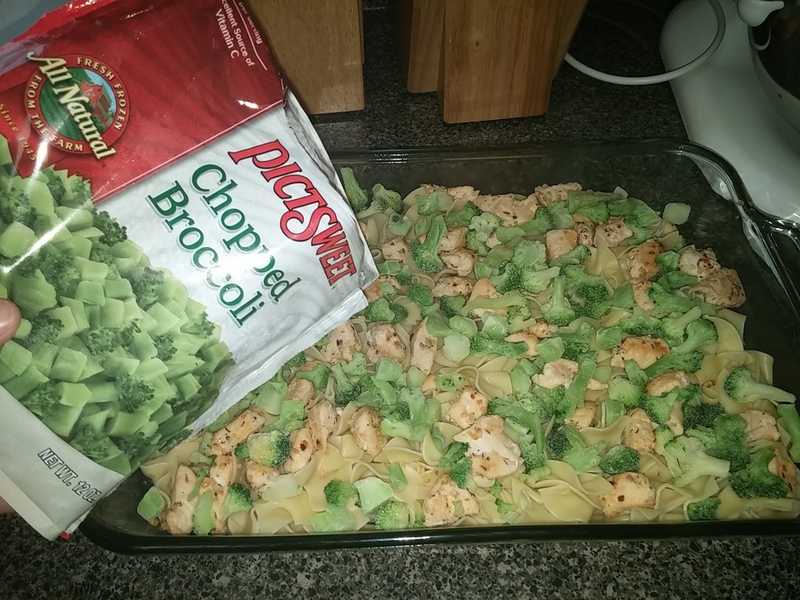 Wal-mart sells the Pictsweet brand of frozen vegetables which thankfully has a bag of chopped broccoli...if you can find the blessed thing. Here lately we haven't been able to find it. I don't cook or even thaw this I just pour the frozen broccoli on top to where there is a good covering over the noodles as in the picture above. If you cannot find chopped broccoli then regular broccoli would be fine as long as you don't put a very large floret in there. Use your best judgment. 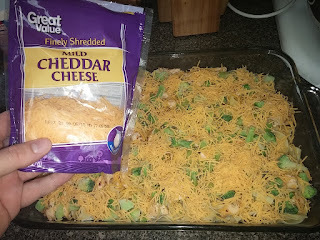 If your regular broccoli is nothing but large pieces then I would suggest cooking them (directions should be on the bag) and then cutting them before adding them to the casserole. Open your Cheese and sprinkle half (approx 4 ounces) over top of the casserole trying to cover every inch of it. 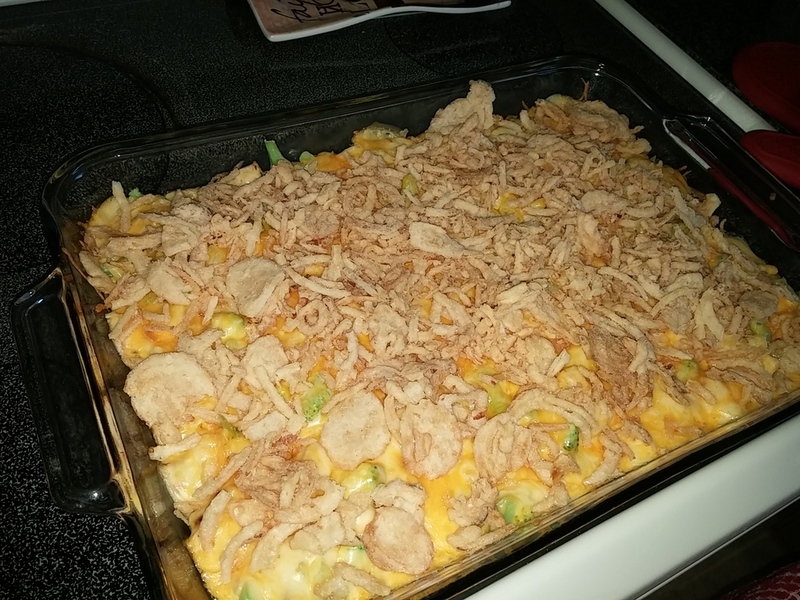 Set your cheese and casserole dish to the side. 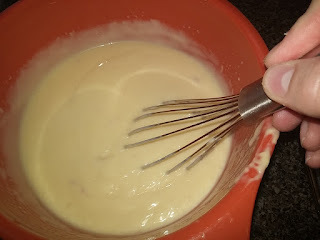 Into a mixing bowl empty both of your cans of Cream of Chicken soup. 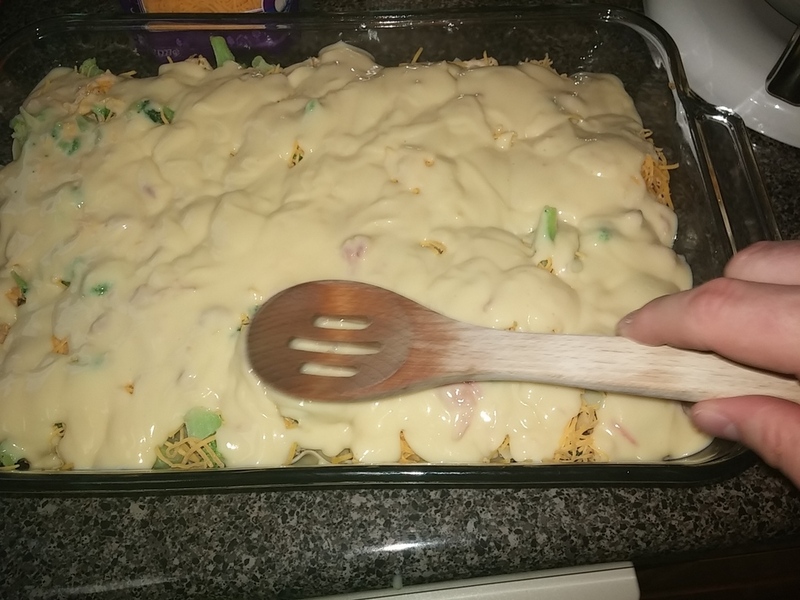 You may need to use a silicone spatula to get all of the soup out of the can. Pour your milk into one of the empty cans. 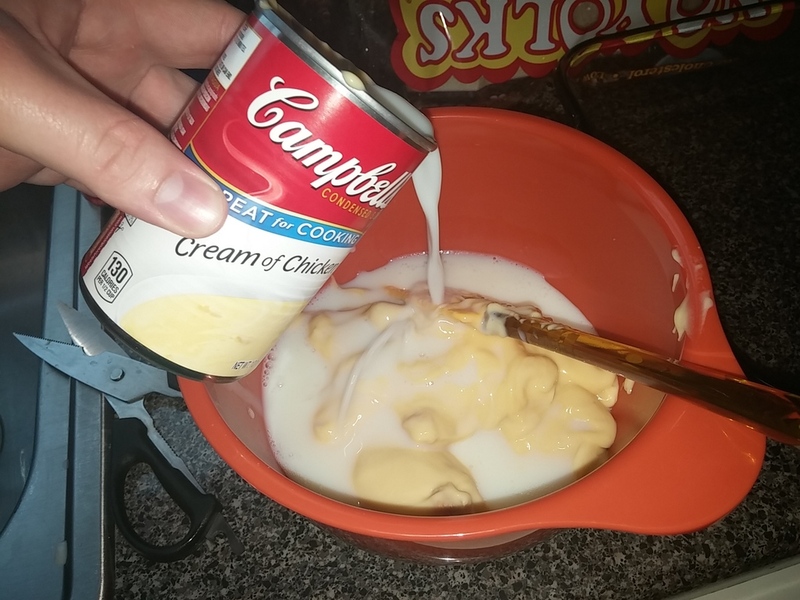 Once the can is full, pour the milk into the bowl as well. Please Note - If you need to use something like Lactaid rather than regular milk that will do perfectly fine. We ended up using Lactaid for this meal. Using your whisk, mix the soup and milk together gently until it is a mostly uniform solution. Don't get too hasty or the milk will fly out of the bowl as you can see near my hand in the picture above. It should eventually make an easily poured solution. 13. Pour Soup Mixture over casserole. 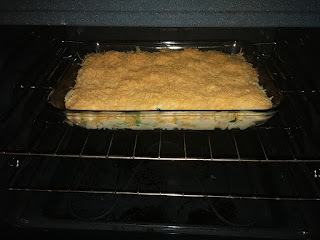 As with the other steps try your hardest to get the soup to cover the majority of the casserole. Use a wooden spoon if you need some help and put a lot in one location by mistake. 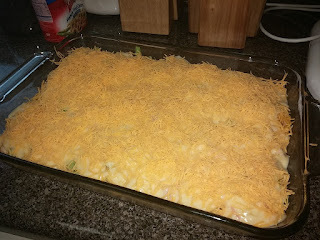 Spread the rest of your cheese over top of the casserole trying to cover as much as possible. Place in the oven and bake at 350°F for 25 minutes. Once your 25 minutes are up, pull the casserole out of the oven and top it with French Fried Onions. 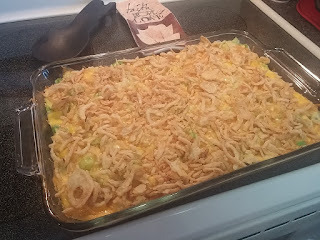 As with all the other steps, make sure to spread them out over the casserole. Place your Casserole back in the oven for an additional 5 minutes. Once your 5 minutes are up let it cool for just a moment then serve up! Hopefully you all will enjoy this as much as my family and friends have!